The Spectacular at your Fingertips! Opera Without Words… or Nearly! 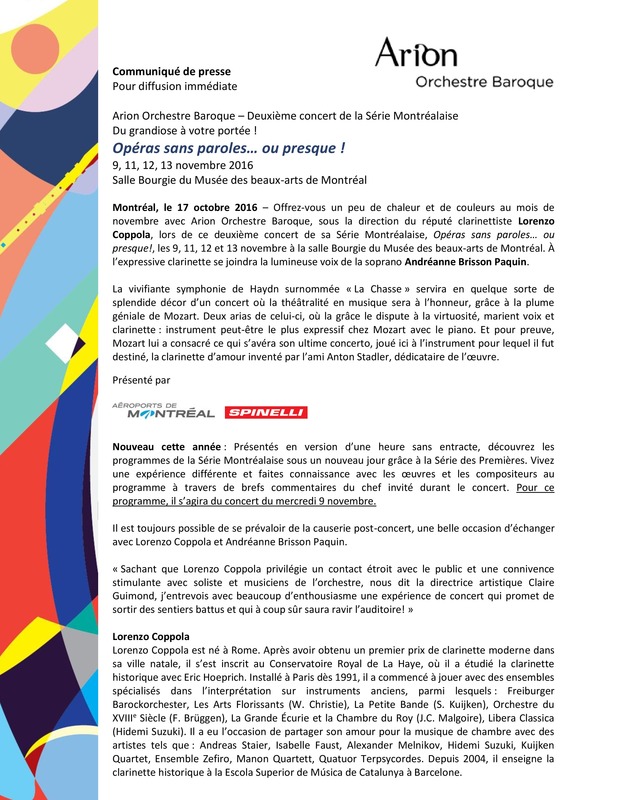 Montreal, October 17, 2016 – Indulge in a little warmth and colour during November with Arion Baroque Orchestra under the direction of the renowned clarinettist Lorenzo Coppola, in the second concert of its Montreal Series, Opera Without Words… or Nearly!, on November 9, 11, 12, and 13 at Bourgie Hall of the Montreal Museum of Fine Arts. Our guest’s expressive clarinet will be joined by the glowing voice of soprano Andréanne Brisson Paquin. Haydn’s bracing symphony nicknamed “The Hunt” will serve as a fine setting for a concert in which musical theatrics will be at the forefront, thanks to Mozart’s genius. Two arias of his, in which grace mixes with virtuosity, will ally voice and clarinet, possibly Mozart’s most expressive instrument with the piano. As a case in point, what turned out to be Mozart’s final concerto was destined to the clarinet, actually in the form of the clarinet d’amour for which it was conceived, invented by the composer’s friend Anton Stadler, and on which it will be performed by our guest soloist. New this season: Discover the concerts of the Montreal Series in a short one-hour version without intermission. Experience music differently and gain a deeper understanding of the composers and their works as our guest conductor provides brief commentaries throughout the concert. For the present program, the concert of this Premiere Series will be on Wednesday, November 9. It is always possible to take advantage of the after-concert talk for a friendly and informative exchange with Lorenzo Coppola and Andréanne Brisson Paquin. Lorenzo Coppola was born in Rome. He has studied historical clarinet under the guidance of Eric Hoeprich at The Hague Royal Conservatory (The Netherlands). After moving to Paris in 1991, he began playing music with a variety of ensembles specialized in playing on historical instruments, including Freiburger Barockorchester, Les Arts Florissants (W. Christie), La Petite Bande (S. Kuijken), Orchestra of the Eighteenth Century (F. Brüggen), La Grande Ecurie et la Chambre du Roy (J.C. Malgoire), Libera Classica (Hidemi Suzuki). He has shared his love for chamber music with musicians such as Andreas Staier, Isabelle Faust, Alexander Melnikov, Bernhard Forck, Hidemi Suzuki, Kuijken Quartet, Ensemble Zefiro, Manon Quartett, and Quatuor Terpsycordes. He has been teaching historical clarinet at the Escola Superior de Música de Catalunya in Barcelona (Spain) since 2004. Praised for her shimmering and expressive voice, the Montreal soprano Andréanne Brisson Paquin captivates by her just and personified musical interpretations. Among her recent concert and recital engagements in Canada and Europe, she has participated in the Festival de musique baroque de Pontoise with the Ensemble Masques, the Festival Classica conducted by Jean-Claude Malgoire, the Festival Bach de Montréal alongside the great musicologist Gilles Cantagrel, the Lufthansa Baroque Festival during a concert aired by the BBC in London, and the Journées de musique ancienne de Berlin. Winner of numerous national and international awards, she graduated from the Amsterdam Conservatory and the Université de Montréal and has been perfecting her technique at the Centre d’Arts Orford, the Académie Francis Poulenc and the Canadian Vocal Art Institute. Since its foundation in 1981 in Montreal, Arion has tapped into the creative energies of Baroque composers such as Bach and Vivaldi by performing their works on period instruments, thus rediscovering the radiant colors of their timeless masterpieces. Thanks to Claire Guimond’s artistic vision, Arion is a cornerstone in the world of early music on period instruments, both on the national and international stage.